The Franklin War Memorial lists the names of the fallen who served in World War One. The unveiling of the memorial to Franklin soldiers took place at Franklin on Monday afternoon in the presence of a large assembly, the ceremony being performed by Lieut.-Colonel Lord, who commanded the 40th Battalion at the front. 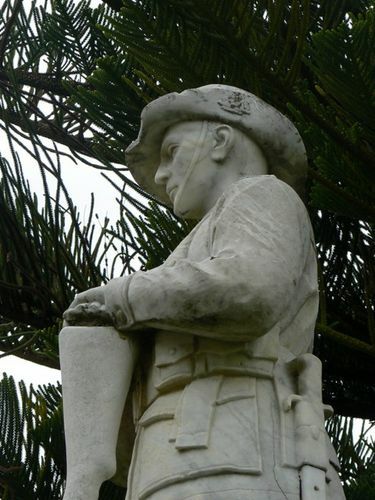 The memorial consists of a statue in white marble, and depicts an Australian soldier standing in mourning attitude with rifle reversed, and is mounted on a block of marble, upon which is inscribed in letters of gold the names of those whose memory it perpetuates. The whole uprises imposingly from a granite base, and occupies a well chosen position in front of the Town hall. Its cost was £365. The Mercury (Hobart), 19th October 1921.